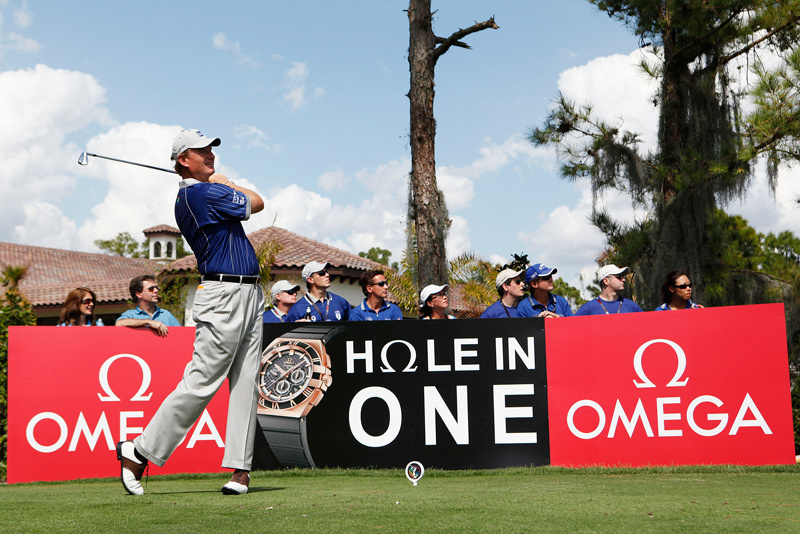 OMEGA the official timepiece of Tavistock Cup 2009 - Ernie Els teeing off on the third hole ("The OMEGA Hole") at the Tavistock Cup in Orlando, Florida. Wednesday 18 March 2009 – Each year, the Tavistock Cup pits teams from two Orlando, Florida-based golf clubs – Isleworth and Lake Nona – against each other in head-to-head competition. Both clubs have membership which includes some of the world’s leading golfers. This year, Graeme McDowell led his Lake Nona team to victory over their Isleworth competitors, who count among their members Tiger Woods, the world’s top-ranked player. This years winner, Team Lake Nona, included, along with captain Ernie Els, Ben Curtis, Chris DiMarco, Retief Goosen, Trevor Immelman, Graeme McDowell, Mark McNulty, Ian Poulter, Justin Rose and Henrik Stenson. The runner-up, Team Isleworth, was captained by Mark O’Meara and who led a team featuring Robert Allenby, Stuart Appleby, Daniel Chopra, Darren Clarke, John Cooke, J. B. Holmes, Charles Howell III, Nick O’Hern and Tiger Woods. The strength of the field at the Tavistock Cup is underscored by the fact that the competing professionals from the Isleworth and Lake Nona Golf Clubs have won a staggering total of 53 major championships and more than 710 career worldwide victories among them.